Patients in psychiatry, or their parents, experiment with alternative methods and practices. Psychiatrists, in search of scientifically-based discussion and evidence of use for daily practice, find that information in this issue of Child and Adolescent Psychiatric Clinics. Readers will find clinically focused information in the major categories of Selected Treatments, Selected Disorders, and Perspectives on Clinical Complementary and Alternative Therapies. Micronutrients for mental disorders, the role of essential fatty acids. EEG and Neurofeedback, Mind-Body Meditation and Movement Therapies, Music Therapy, are presented. Evidence for minerals, vitamins, and herbs is discussed. 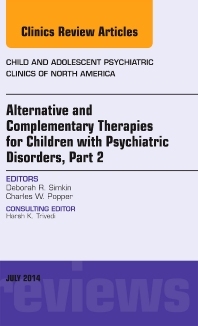 Guest Editors Deborah Simkin and Charles Popper, with decades of experience in working with complementary therapies, lead this issue.